I have finally finished my store upload and all my new products are ready for business. Click image to get to store. 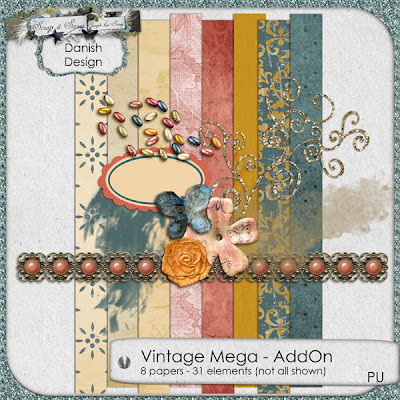 As promised, one of the newbies is also a freebie :o))) It's an Add-On to my new "Vintage Mega Kit" and contains 31 elements and 8 papers, all full size/300 dpi. The only thing is, you have to get it from the store, sorry. Click image to get directly to the Add-On in store. I really hope you will find something you like among all the news. See you soon - if I don't melt (have had boiling hot weather for the last two days!!!). thanks for the awesome add-on! love the new stuff! it's been so hot here in vegas, plus humidity (it's almost never humid here in the desert - this summer has been awful) 112+ degree weather with 40 percent humidity - I can't wait for fall! Thank you so much for this post. I want to let you know that I posted a link to your blog in CBH Digital Scrapbooking Freebies (please, notice the new url for my blog), under the Page 5 post on Aug. 21, 2012. Thanks again. It's been awhile and I wanted to let you know I dedicated my freebie today to you. I just love your "smily" guy and I couldn't wait to think of the perfect way to highlight his cuteness. Do come and stop by and say hi. Plus, I am finally back after what seems like a LONG UP HILL month and a half. Hugs, Sue @ grands9creations.